a muslim homeschool: Reader question: When a child asks about school and finding friends their age. 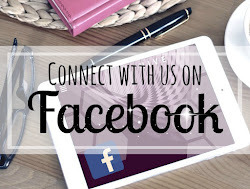 Reader question: When a child asks about school and finding friends their age. It's funny, when people think of home education what often tends to come to mind first is socialisation and peers. And then when we think of main stream school, we think exactly the opposite; finding both teachers and parents alike telling the kids they are at to school to learn not to socialise. Go figure! This months reader question asks about socialisation and kids asking about school. 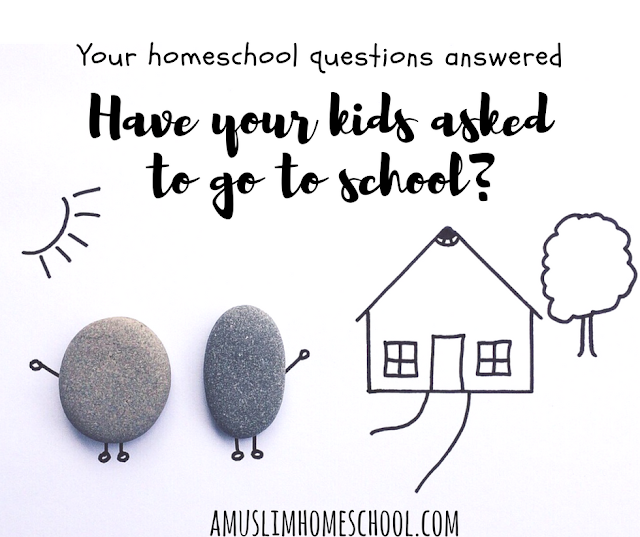 You can ask your homeschool questions through the contact page, Facebook, or Instagram and help build a list of Home School FAQ's which I hope will benefit our community bi'ithnillah. 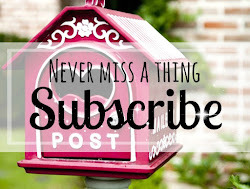 I want to apologise in advance for the text in this post....it is a little all over the place with changing sizes and fonts....I don't know what happened but I can not figure out how to adjust it to follow the default font settings - and I have tried everything I know! To answer your first question; my children have indeed asked why they could not go to school. And I know other home educating families whose children have done the same. I think it's natural that they would ask. The curiosity of what we don't have, mixed with the imagination of a curious young mind, inspires a fantasy world of fun hidden away behind those big school gates. However, with that being said, fast forward a couple of years to my eldest who turned 11 several months ago. 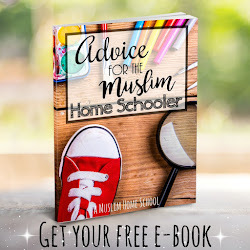 Now as our studies become more serious as we transition into secondary education, she realises what a good deal she has home educating Alhamdulillah, and is her preferred choice. 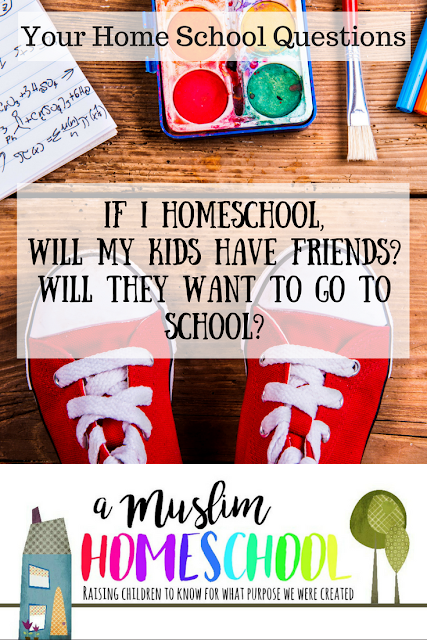 She can now understand with full comprehension that school isn't one big all-day fun fair, and she enjoys the unrestrictive freedom we have to study what is relevant to her own interests and needs, as well as enjoying a safer, more Islamic environment. Home education serves her. She recognises that Alhamdulillah. So if you have concerns that your children may want to go to school, they very well may do. 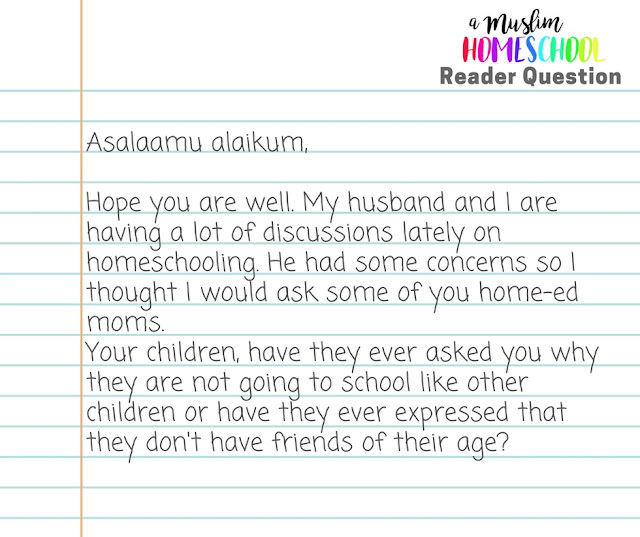 But I don't see that as a reason not to home school. Our children may not understand all the choices we make for them whilst they are young, just as I am sure we didn't get our own parents decisions back when we were kids ourselves. But if our decision is one that we feel is best for them, with their best interests at heart, inshaAllah once they grow they will have the maturity to see why we did what we did, and not only value but appreciate those choices we made. To answer your second question, yes my children have friends. Contrary to common belief, home educators do leave the house (smile)......I know to some people that comes as a shock! I guess the logic behind this mythical idea, is if school kids spend all day sitting inside a classroom, then that must be what home schooled kids do too right? They do have friends (big smile). Your family will be as social or anti social as you want them to be. The challenge we have in our society is that we are led to believe that if a child doesn't attend school, they will be socially handicapped....for life! 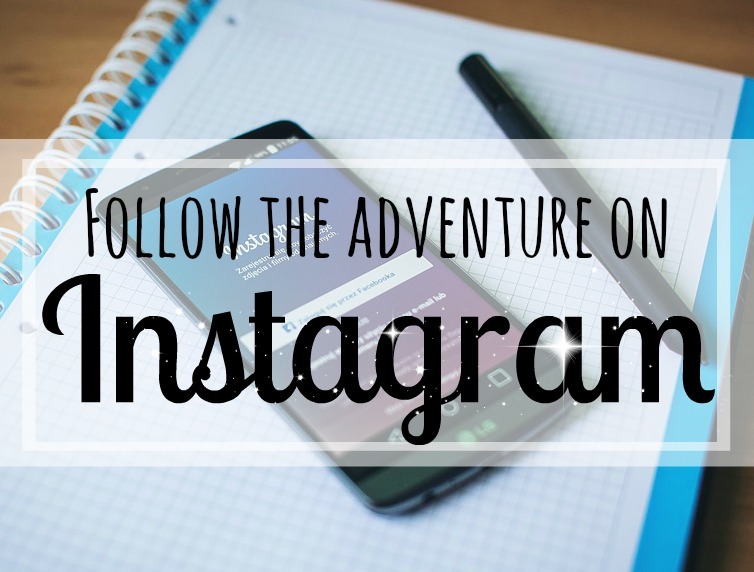 Sure, you may have to be a little more actively involved in finding friendships for your children if you are not relying on a typical classroom where all the local kids are lumped together and left to find and develop their own social interactions. But is that a bad thing? I know many school parents actively seek good companions outside of school to ensure their children have good wholesome friendships with families they know and trust bi'ithnillah. 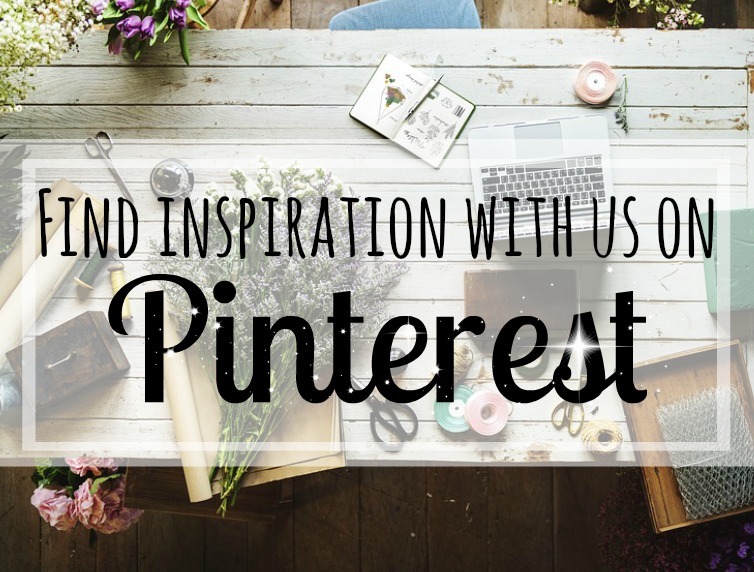 So finding friends as a home educator is no different. Have you thought about how many children in school even have a positive social experience? How many are left in the corner of that hyper playground, alone and invisible? What does that do for their long term social and emotional wellbeing? I have to say here, school socialisation in my view, is the most unauthentic of social experiences. In the real world, how many adults get away with bulling? If someone ain't that nice, you are not going to tolerate it, and you wouldn't be expected to. Yet for some reason, we seem to think children in that position must. And it destroys them. In the real world, you spend your time with people you love, value and trust. You spend time with people you like and find common values with. In school, we throw all the kids together and expect them to like each other, and if they don't or if someone is mean, there is not really a lot done to truly stop it. 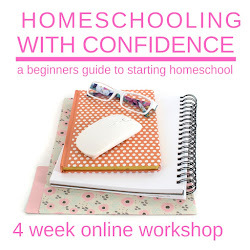 Home schoolers get together, arrange play dates, organise activities and trips. They get to meet people of all ages, not only be lumbered with a group of people who happen to have the same numerical value as themselves. They can experience real world socialisation. 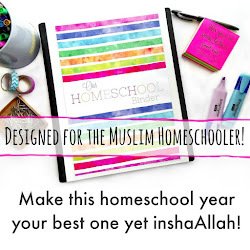 Home schooling is growing globally, and within the Muslim community I really do see it is on the increase as more and more families see the richness home education gives them Alhamdulillah. 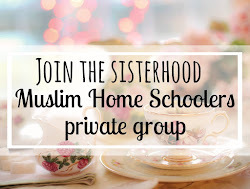 Finding other home schoolers is not as difficult as perhaps it once was, but that is not to say all friends will be fellow home educators. There is no rule book to say they have to be. Wherever you find people, you can usually find a friend. This is the beauty of home education. The choices are yours.